Imperfectly Painted: Sally Hansen In A Flurry...Dud? I actually almost titled this post "Sally Hansen In a Fluffy". That would of been more entertaining. As far as I know In a Flurry is/was an LE color from the Sally Hansen Insta-Dri line. I saw swatches of it online thought it was the coolest thing since sliced bread, and went on a mission to find it. I found it, I swatched it. I thought it was extremely underwhelming, so much so it irritates me. I'm actually hoping my bottle is a dud or something because it looks nothing like other swatches I've seen. In a Flurry is a deep navy/teal jelly base with blue, green, gold, and, silver flecks of glitter and a purple duochrome-like shimmer. This looks absolutely nothing like Scrangie's amazing photo of this. In fact, I've seen some blogs with photos of it where it looks amazing, and some blogs where the colors looks really lackluster like mine. The glitter in mine was drowned out by the base, and I barely noticed much sparkle at all. The shimmer in it seems too pronounced . I don't know if either the bloggers who had great pictures of it just have really awesome cameras, or if there is a not-so-great batch of this polish out there that some of us got? It's certainly not a horribly ugly polish, but based on what I saw from other bloggers it looked 10 times better than this! It's not what I expected at all. It's a mystery to me. That's crazy how different they are. The inconsistency in some polishes never ceases to amaze me. That's crazy. I bought it because of Scrangie's awesome swatch too! I was expecting to need thinner for it but my bottle was fine. Weird. I saw it on Scrangie's blog and thought I wanted it, then when I looked at it in the store I decided I didn't need it. That looks a lot different from mine! 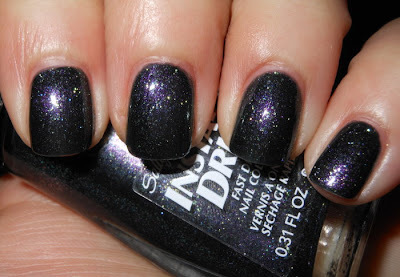 I posted swatches on my blog and mine looks more like a black base with tons of different colors in it. At first, I thought this was a picture of Purple Haste from the same collection. My bottle is a dark green/gray! The formula was awful and so was the brush (it was actually fluffy and twisted). Definitely not the regular Insta-Dri formula that I know and love. I bought it based on how awesome Scrangie's swatches looked, and I'm totally disappointed. I also picked this one up because of Scrangie's post about it- as far as I can tell mine looks pretty much the same as hers did in the bottle, but I haven't tried it on the nail yet. Hope mine isn't the "dud" version. Sorry you had bad luck with your bottle! I also have seen a couple photos of this on blogs where it looked like stars in outer space and others where it looked flat...I though the ones that looked flat were just bad camera luck...nope...I bought this guy and like yours, mine too is a total dud bottle. I took it back because I bought it at a store that does take returns on even open cosmetics. Total waste...must be a couple productions of this one - good and really bad - mine was not even mid of the road - it just was horrible. Scrangie makes even crap nail polish look amazing. It's actually kind of a problem, since it never looks that way on me when I buy it. XD Did you see her picture of Sally Hansen Pumpkin Spice last year? I have no clue how she got it opaque. This is the most confusing polish I've ever seen. I love it, I hate it sometimes. Weird. Wow, Scrangies pictures do look awesome!! Make me want to get that line!! It's a bummer to hear about your bottle though!! That happened to me with one of the OMG China Glaze polishes, it was so anti-climactic that I thought I had a fake!! Wow those look nothing alike. Even your bottles are different. Perhaps your bottle was mismarked? I love this one but my pictures of it are horrible. I know Mimi/Makeup Withdrawal was disappointed, too, so I do wonder if there are bad batches? I think other bloggers just have nice cameras that pick up on the color distinction better :/ I mean, when I wore it, it had all the elements that Scrangie's bottle had... it just left me wanting much, much more. Okay, so I'm wearing my bottle of In a Flurry, and it's not all that. Some disappoint face going on here. :( When it was still wet on the nail, it looked all amazing (a la Scrangie's swatch), but then it dried and it's pretty meh. I mean, not bad, but not amazing either. Although what you got looks different than what you expected, I still think it's nice. But what a bummer that it was a let-down for you. I agree that there must be more than one batch of this going around. Saw this at the drugstore a couple of weeks ago and almost bought it. Now I may go back to check it out again to see if it's the dud or the real deal.